Emil Romig scored in the first period as Denver throttled Notre Dame to reach the National Championship game. 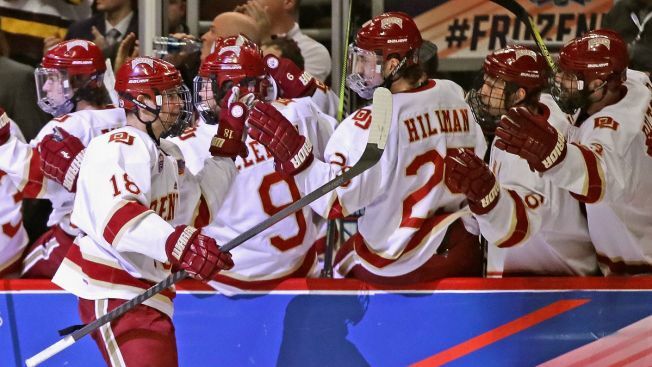 Denver came into the Frozen Four as the top-seeded team, and they lived up to their billing as they throttled the University of Notre Dame to reach the Frozen Four championship game. Tariq Hammond scored a goal and added an assist, and Colin Staub had a pair of assists as the Pioneers set up a battle with Minnesota-Duluth in the tournament title game on Saturday night at the United Center. Denver came out of the locker room dominating the pace of play, and they were quickly rewarded with a goal just eight minutes into the contest. Staub made a tremendous spin move to get into the zone and create some space on the ice, and his feed to Emil Romig was spot-on as the winger fired home a top-shelf goal to give the Pioneers a 1-0 lead. With about five minutes to go in the period, Denver struck again to extend their lead. Liam Finlay and Will Butcher took turns skating the puck around the zone, and Butcher eventually found Henrik Borgstrom wide open in front of the net. Notre Dame goaltender Cal Petersen had no chance on the play, and Borgstrom scored his 22nd goal of the season to put Denver ahead by two goals. Irish defenseman Dennis Gilbert led the team’s physical response at the start of the second period, but despite the hits they were able to level, Denver continued to dominate puck possession and kept piling up goals. Hammond scored off a feed from Evan Janssen on a 2-on-1 rush to make it a 3-0 game with about six minutes to go in the period, and just over two minutes later Dylan Gambrell added a tally on a wraparound goal. To put some icing on the cake, Staub intercepted a Notre Dame clearing attempt with a little less than two minutes to go in the period, and his pass to Evan Ritt was perfectly weighted as the senior center lifted a wrist shot under the crossbar to make it a 5-0 game after 40 minutes of action. The third period casually moved along without much drama, but Notre Dame was finally able to get on the board later in the frame. Jordan Gross uncorked a slap shot from the point on a power play, and Cam Morrison deflected the shot into the back of the net to cut the Denver lead to 5-1. The Pioneers ended up pushing their lead back to five goals late, as Gambrell scored his second goal of the game on a bank shot from behind the net and off of Petersen's pads to make it a 6-1 game. Denver will take on the University of Minnesota-Duluth in the national title game on Saturday night. Puck drop is scheduled for 7 p.m., and the game will air nationally on ESPN.